Planet Audio PL4000.1D. 4000W Max Pulse Series Class-D 1-Ohm Stable Monoblock Power Amplifier. Class-D 1-Ohm Stable Monoblock Amplifier. 3-way protection circuitry (thermal, overload, and speaker short protection). Planet Audio PL2500.1M. 2500W Max Pulse Series Class A/B Monoblock Power Amplifier. Class-A/B 2-Ohm Stable Monoblock Amplifier. 3-way protection circuitry (thermal, overload, and speaker short protection). 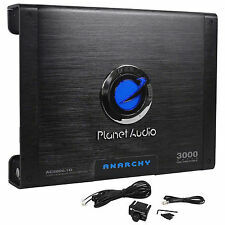 Planet Audio AC1500.1M 1500 Watt 2 ohm stable Mono Car Amplifier Free Bass Remote. 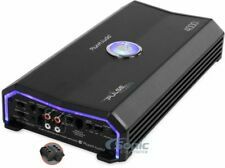 Planet Audio AC1500.1M 1500 Watt Class A/B Mono Car Amplifier 2 Ohm Stable. Item Code: AC1500.1M. RMS Power Output: 700 Watts x 1 Channel @ 4 Ohm. Installing an amp incorrectly can cause it to blow. I have used this amp for years so I know it is in great working order. Planet Audio AC2500.1M 2500 Watts Class A/B Mono Car Amplifier 2 Ohm Stable With Remote. Item Code: AC2500.1M. RMS Power Output: 1500 Watts x 1 Channel @ 4 Ohm. Max Power Output: 2500 Watts x 1 Channel @ 2 Ohm. Signal Processors/ Equalizer. Amplifier Type 2-way protection circuitry (thermal and speaker short protection). Signal to noise ratio: 100 dB. Max Power Output Phone & Tablet Accessories. Heavy duty aluminum alloy heat-sink for maximum heat dissipations. 3000W Max (2250W RMS) Torque Series Class-D Monoblock 1 ohm Stable Amplifier with Bass Knob. Planet Audio TR3000.1D. Planet Audio Torque Series TR3000.1D. Class-D 1-ohm Stable Monoblock Amplifier. 3-way protection circuitry (thermal, overload, and speaker short protection). Planet Audio PL2500.1M. 2500W Max Pulse Series Class A/B Monoblock Power Amplifier. Class-A/B 2-Ohm Stable Monoblock Amplifier. Amplifier Install Kit. 3-way protection circuitry (thermal, overload, and speaker short protection). Planet Audio AC5000.1D. 5000W Max Anarchy Series Class D Monoblock Power Amplifier. Check out thePlanet Audio AC5000.1D Owner's Manual. Anarchy Series Class D Monoblock Car Amplifier. If you are installing more than one amplifier, you will need adistribution block. Big Bang 2500W Max Monoblock Class D Amplifier. 2500 W X 1 Max @ 1 ohm. 1100 W X 1 RMS @ 2 ohm. 700 W X 1 RMS @ 4 ohm. MPN: PL1500.1M PKBL2. -8 Gauge Complete Amplifier Install Kit Included. Amplifier Install Kit Includes Car Audio & Video. -Switchable Input Sensitivity. -(1) AGU fuse holder 20amp fuse. Located in Los Angeles, CA. Planet Audio TR5000.1D. Planet Audio Torque Series TR5000.1D. 5000W Max (3750W RMS) Torque Series Class-D Monoblock 1 ohm Stable Amplifier with Bass Knob Included. Class-D 1 ohm Stable Monoblock Amplifier. Marketing Information Get your music thumping with the Planet Audio Pulse PL1500.1M Class A/B Monoblock Amplifier. Put your tunes in gear with the Planet Audio PL1500.1M. More from the Manufacturer. Trending at $63.95eBay determines this price through a machine learned model of the product's sale prices within the last 90 days. PLANET AUDIO SA4000D. MONOBLOCK POWER AMPLIFIER. 4000 WATTS MAX POWER CLASS D. Max Power @ 1 Ohm: 4000 Watts x 1. Max Power @ 2 Ohms: 2000 Watts x 1. Input Sensitivity Selector. Signal-to-Noise Ratio (SNR): 80 dB. Model: AC3000.1D. 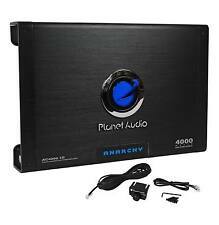 Planet Audio Anarchy Series Class D Monoblock Car Amplifier. Signal Processors/ Equalizer. Amplifier Type 3-Way System Protection circuitry (thermal, overload, and speaker short protection). Model: PL2000.1M. Planet Audio Pulse Monoblock Class A/B Car Audio Power Amplifier System. Class-A/B 2-Ohm Stable Monoblock Amplifier. Signal Processors/ Equalizer. Amplifier Type 3-way protection circuitry (thermal, overload, and speaker short protection). Planet Audio AC1500.1M. 1500W Max Anarchy Series Monoblock Power Amplifier. Anarchy Series Monoblock Car Amplifier. 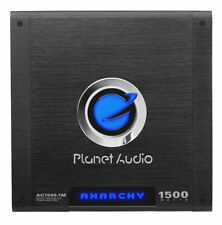 Amplifier Series Anarchy (Planet Audio). If you are installing more than one amplifier, you will need adistribution block. 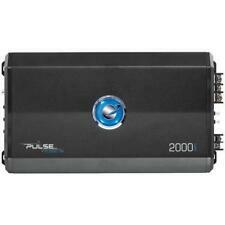 Planet Audio Pulse PL3000.1D Car Amplifier - 2250 W RMS - 3000 W PMPO - 1 Channel - Class D (pl30001d). Marketing Information Get the compact stability and great sound of the Planet Audio Pulse PL3000.1D Monoblock Class D Amplifier. 20 00W Monoblock Amplifier. This amplifier is designed for those with serious performance in mind. Also works great in Marine and ATV applications when not exposed to direct water. Blue Backlit Illumination. Planet Audio TR4000.1D. Planet Audio Torque Series TR4000.1D. 4000W Max (3000W RMS) Torque Series Class-D Monoblock 1 ohm Stable Amplifier with Bass Knob. Class-D 1-ohm Stable Monoblock Amplifier. 1 ohm: 3000 watts x 1 chan. MAX POWER (2 OHMS) 1500W x 1. PLANET AUDIO PULSE SERIES PL1500.1M 15 00 WATT MONOBLOCK AMPLIFIER. FREQUENCY RESPONSE 15-20kHz. LED Illuminated Both Ends Panels and Badge. Variable Subsonic Filter. Variable Bass Boost. Planet Audio PL3000.1D. 3000W Max Pulse Series Class D Monoblock Power Amplifier. Class-D 1-Ohm Stable Monoblock Amplifier. Amplifier Install Kit. 3-way protection circuitry (thermal, overload, and speaker short protection). Planet Audio AC5000.1D TruConnex TC4KIT-8B. Planet Audio AC5000.1D. Check out thePlanet Audio AC5000.1D Owner's Manual. AC5000.1D TC4KIT8B. 5000W Max Anarchy Series Class D Monoblock Power Amplifier. PLANET AUDIO SA6000D. MONOBLOCK POWER AMPLIFIER. 6000 WATTS MAX POWER CLASS D. Max Power @ 1 Ohm: 6000 Watts x 1. Max Power @ 2 Ohms: 2400 Watts x 1. Input Sensitivity Selector. Frequency Response: 20 to 20000 Hz. Product SKU: 150395 ID: ac1500mk. Planet Audio AC1500MK. 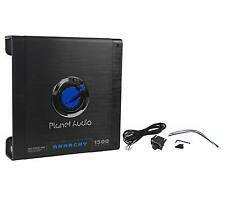 Planet Audio Anarchy Series AC1500MK. 1500W Max (563W RMS) Anarchy 2 ohm Stable Monoblock Class-A/B Amplifier w/ Complete Wiring Kit. Class-A/B 2 ohm Stable Monoblock Amplifier. Planet Audio 5000 Watts Monoblock Class D Amplifier (TR5000.1D). Planet Audio TR5000.1D 5000 Watts Monoblock Class D Amplifier. SKU: TR5000.1D. 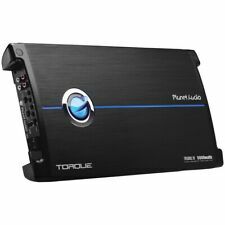 Torque 5000W Monoblock Class D Amplifier. Amp Topology: Monoblock Class D.
Planet Audio AC4000.1D 4000 W ANARCHY MONOBLOCK Amplifier FREE CELL ANTENNA. Planet Audio AC4000.1D. 4000 W Max Anarchy Series Class D Monoblock Power Amplifier. · Anarchy Series Class D Monoblock Car Amplifier. MPN: PL2500.1M. -1875 W X 1 RMS @ 2 ohm. -938 W X 1 RMS @ 4 ohm. PEAK POWER @ 2 ohm: 2500 Watts x 1. RMS POWER @ 4 ohm: 938 Watts x 1. SPEAKER IMPEDANCE: 2 to 8 ohm. Car Audio & Video. FREQUENCY RESPONSE: 9 Hz to 250 Hz ±1 dB. 12dB/24dB Slide Switch to choose LP Slope. Soft turn-on circuit. Remote turn-on/turn-off circuit. Located in Los Angeles, CA. Car Audio & Video. 50-250Hz, 24dB/octave Variable Low Pass Filter. Car Security. Need to add an amp to power a subwoofer or extra speakers?. When space is limited, but your passion for great sound and power is not, the Pulse Series Monoblock Class AB MOSFET Amp (2,000 Watts Max) from Planet Audio is just what the doctor ordered. Damping Factor @ 20Hz, 4 Ohm: 400. Frequency Response: 20Hz-250Hz. NEW 2500w Monoblock Car Subwoofer Amplifier.Power Speakers subs Amp.AB.Bass. This amplifier is designed for those with serious performance in mind. Also works great in Marine and ATV applications when not exposed to direct water. Blue Backlit Illumination. Variable Low Pass Crossover, Variable Bass Boost. MPN: PL3000.1D. -2250 W X 1 RMS @ 1 ohm. -1125 W X 1 RMS @ 2 ohm. -563 W X 1 RMS @ 4 ohm. -4500 W X 1 RMS Strapped Bridged Power @ 2 ohm. PEAK POWER @1 ohm: 3000 Watts x1. PEAK POWER @2 ohm: 1500 Watts x1. One Ohm stable mono operation. Located in Los Angeles, CA. Car Audio & Video. Information Class D operation. AC-DC Power Supplies(current). Car Security. LED power and protection indicators. Go to top. Planet Audio AC5000.1d 1-Channel Car Amp. Condition is Used. Shipped with USPS Priority Mail. NEW 3000w Monoblock Car Subwoofer Amplifier.Power Speakers subs Amp.ClassD.Bass.